Waitrose has always been seen as the sweetheart of the nation's foodies – but profits are beginning to slip. 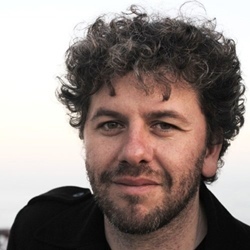 Ollie Lloyd takes a look at the reasons why. Ollie is the CEO of Great British Chefs. John Lewis Partnership, owner of upmarket grocer Waitrose, announced today that profits will be close to zero for the first half of the year, naming economic uncertainty as a reason for the profit warning. 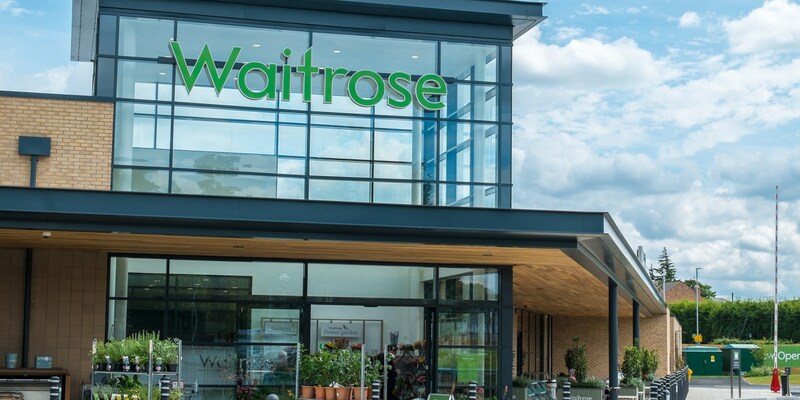 The company plans to close five Waitrose stores (including two in London) and said it is “rebuilding profitability at Waitrose” and focusing on its core customers. Despite Waitrose historically being the darling of England’s foodies, it is facing headwinds like never before. The reality is that Waitrose is trying to solve an impossible equation in the balance of value and quality whilst also embracing the digital revolution. On one side, it has to chase value in order to compete with Tesco, Aldi and Lidl and to satisfy consumers who are feeling the pinch after the Brexit vote. On the other side, it has to be premium and trendsetting in order to inspire its core foodie audience and ultimately differentiate itself. At the moment, it seems that Tesco is winning, having recently announced growth of 3.5% in the 13 weeks ending 26th May, while Aldi and Lidl show no signs of slowing their store growth. 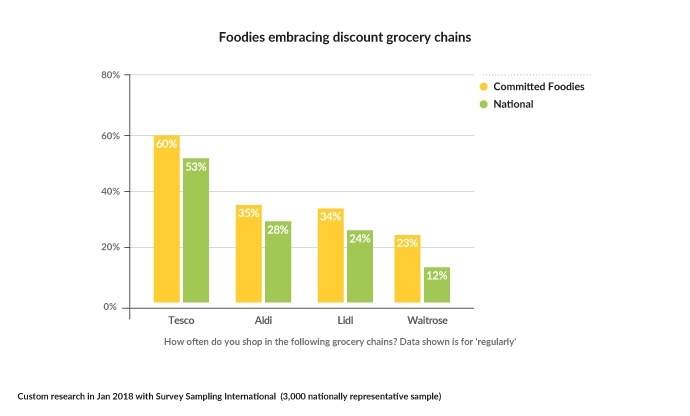 A nationally representative survey conducted by Great British Chefs in January 2018 found over a third of foodies reporting to shop regularly at discount grocery chains Aldi and Lidl, compared to only 23% shopping regularly at Waitrose. The reality is that both Aldi and Lidl have focused on attracting more premium customers with an ever-growing range of specialist items which sit alongside their value ranges. Foodies are clearly being drawn in and this is ultimately going to reduce their levels of spend at other retailers. The same survey also found that an increasing number of foodies are turning to independent shops, perhaps driven by historical food scandals and a desire for more niche brands. The big retailers tend to stock the same brands and items as each other, with the truly special products often only found in specialist outlets. It is also the case that many brands are making use of their direct access to consumers to sell more specialist items directly. Brands like Maille have launched shops, both online and on the high street. Category specialists like Brindisa offer a far wider range of Spanish goods than any mass retailer ever will and experts like Willie’s Cacao sell unique items exclusively on their website. All of this means that foodies are increasing seeking the basics from the retailers and getting the more interesting items either at specialist stores, online or at farmers markets. In John Lewis’s press release, it said: “It is widely acknowledged that the retail sector is going through a period of generational change and every retailer’s response will be different. For the Partnership, the focus is on greater differentiation – not scale.” The challenge is to deliver on this vision. There is a huge amount of innovation in the food world at the moment and loads of brands want to get in front of foodies. The challenge is often getting noticed and securing distribution. If Waitrose can make itself the true friend of food innovators and emerging brands it will be both differentiating itself and helping to make Britain’s food scene as vibrant as foodies want it to be. 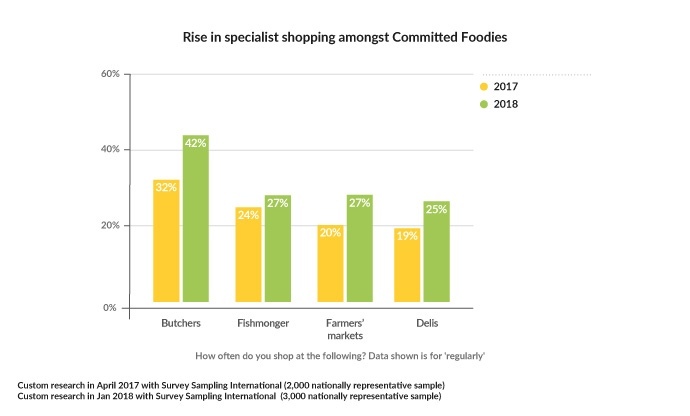 Great British Chefs recently launched another national research study to further understand the changing shopping habits of foodies. This time the focus is on the reasons behind foodies’ shopping decisions like dietary considerations, free-from claims and the types of meals eaten at home. If you want to see the results and learn more about the work we are doing, make sure you follow us on our various channels.